We all remember tOSU's ugly "pro combat" uniforms they wore last year in Ann Arbor? Well, it looks like the Buckeyes will be doing the same thing this year as well. I know Oregon gets a lot of flack for their ugly uniforms all the time, but at what point his it become cool to wear stuff like this? Excuse me, but those are awful. 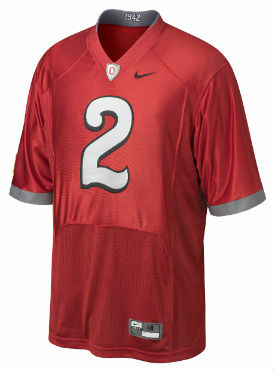 Not that it's a far cry from tOSU's normal ugly uniforms, but still. Thank goodness for the American flag on the sleeve, we might have forgotten which country we were playing in. And what about the helmets? Just plain red? Where are all of the pot leaf stickers? How are we going to know which are the best players without seeing stickers all over the helmet? A couple really interesting videos have popped up since the airing of the Wisconsin broadcast on Saturday. I was at the game, so I didn't see these until yesterday. First of all, it doesn't seem to be some sort of punishment as Demens and his teammates are celebrating. This happened right after James Rogers intercepted Tolzien for his first non-completion of the day. Tolzien had completed something like his first 14 passes in a row up until that point. If that deserves a stuffed animal to the face, than I don't know what to say. A lot about this video bothers me. And a lot about this next video bothers me too. What Rich doesn't know is, most of the fans in the stadium and watching at home have been making this face all day as well.